O...K... Sorry about the diversion. Yes, I had another fun morning. Especially early on the waves were fairly good shape. My F4 Quad worked out good, though, I really should have had a long board, or even a full fledged fish. Why? Because I think that the initial glide and speed is very important for keep going. You could sit inside, but most inside waves get bounced off the the backwashing waves and just simply do not happen. The outside waves are mushy enough that I just don't get that last jolt of the impulse power that I need to get going... surfing is tricky in these regards. Is surfing an obsession for me? This topic comes up a lot. I also get questions from other people about "How can you go every day? ", "Are you not married?" So, I must say that surfing for me is a passion. It is a passion for me to be healthy, and it is a passion for me to find out more about myself, and how I can really relate to the nature. These are actually fairly difficult thing to articulate but this blog is one way for me to really reflect on that sort of things. In terms of how I can stay being married, I must say that I do have a very understanding wife, but then it is not a one-way thing. I also understand and support her passion too. We each respect that. I support her in all respects, and we respect each others passions too so when I am engaged in my passionate activities she does not need to get involved, and vise versa. But then we also do things that would accommodate both our needs. When we go to Orange county or La Jolla, I surf then we also go to museums and restaurants. After all, I cannot be surfing all day. In fact for me surfing is a 90-min a day thing. Kind of like the daily prayer a buddhist priest would do in the morning in front of the alter. Once in a water I will do my best to catch as many waves as possible. Try to be focused at the same time let the nature take me to where it let me go. I am exhausted at the end, but then happy too. When that's over then the rest 22.5 hours are for both of us. So when I go to, say, the Trestles, we both go down the path and she would watch or read her books. When the 90 min is over then we head out to go lunch, go to museums, go to Balboa park or the Zoo or do things like that we both enjoy. In the evening, why not go see a movie or just go have some drinks! If I am back at home, she can go shopping at Pacific Ave in SC. 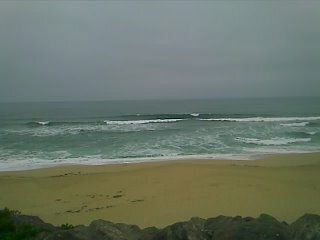 Or when I came back from surfing we eat lunch together and head out for MoMA and then a movie at Metreon. We have plenty of time and plenty of things to do together. Surfing does not get in the way, really. Also I must say that I am fortunate enough to live within a waking distance from the ocean therefore, even if I need to drive to a surf spot it is matter of 10-15 minutes and not hours. But I also made a choice to live close to the ocean and made every effort to the goal. It took me about 30 or more years to get to the stage where I can say that I am a part of the coast side community. But I did make that effort. So I think that you can be creative and arrange your life around your passion as its core driving force of your life.